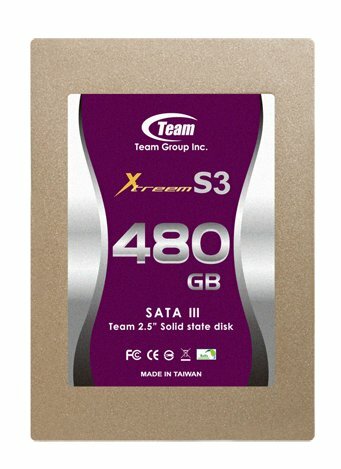 Team Group announced the S25AS3 solid state disks, they offer SATA 6Gbps and are available in 60GB, 120GB, 240GB and 480GB capacities. The 240GB model offers 550MB/s read speeds, 520MB/s write speed and 4k random write performance of up to 90,000 IOPS. The specifications of the 480GB are unknown but the other versions are slightly slower than the 240GB model. In order to satisfy the new generation’s need for extreme speed, the world’s leading memory storage product brand Team Group Inc. released the first generation 2.5 inch SATA III SSD to firmly display their ambition to grab market share. SSD S3 uses the high standard SATA3 6Gb/s interface, and is equipped the enthusiast level SandForce controller as the core helmsman; when compared to the previous generation SATA 2, not only does it maintain Team Group’s consistent high standard product stability and security, it also comprehensively increases the reading and writing speed, leading SSD’s super efficiency towards a new revolutionary realm. In order to welcome SSD’s next extreme speed evolution generation, Team Group has spent a long time on careful R&D, and finally released the all-new super efficient Xtreem S3. Pursuing detailed speed performance just like professional enthusiasts, S3 perfectly displayed the highest reading speed of 550MB/s, along with an impressive writing speed of 520MB/s (240GB). The random writing speed even reached as high as 90000 IOPS (input/output operations per second). It also integrated the three major protective airbags, S.M.A.R.T self monitoring, RAISE and ECC correction, allowing speeding professionals to activate the turbine speed at any time and enjoy the pleasure of leading far ahead. S3 is released with a total of four capacity specifications from 60GB~480GB, allowing different levels of speeding enthusiasts to enjoy S3’s exceptional performance.